My parents used to say "paycheck" when one of us five us kids did something cool. And I totally get it. My kids' first smiles and "momma-dadda" were always fun. And catching them being nice to someone always pays off. But I'm a sucker for a sense of humor. Love watching that develop. Do future goals for my children only include humor? Not at all. World-famous brain surgeons can be funny. Pretty sure Chuck Norris is hilarious. And according to my son, a person can be both funny and an outside linebacker for the Greenbay Packers. However, a quick wit isn't all it takes for me to say "cha-ching!" Watching them sleep does the trick. Or walking across the room - I can watch that all day. I'm even amazed when they just stand there. And the more awkward and tween-ish looking, the better. And paychecks also quickly roll in when my kids obey. But I remember a fellow mom once lectured me on how it shouldn't have to take "to the count of three" for my kids to stop touching the mannequins in Kohl's. "When properly trained," she had said, "they should listen and obey on the count of one." However, I admit the best paychecks come when my teenager, for example, has a tough day at school and saves-the-drama-for-her-momma until she gets home. She views home as a safe place to de-frazzle and be accepted. So before she empties the dishwasher, I've already gotten a paycheck by knowing my daughter finds peace in the presence of her mom and dad. And in Matthew 3:17, before Jesus did anything, God the Father said, "This is my Son, whom I love; with him I am well pleased." As author Alicia Britt Chole puts it, "Before Jesus preached one sermon or enlightened one mind, before Jesus healed one body or saved one soul, God sounded his affirmation from above over Jesus' life." Okay, got it. That parent/child relationship thing is key. So before I make the bed or make dinner, I'm affirmed by God. Before I make the news or make it famous, I'm affirmed by God. 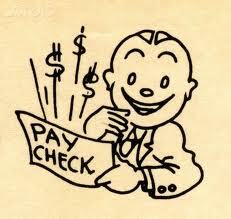 Through Jesus, I can rest in knowing I am his "paycheck" - just as I am. Sophie in the back seat talking to Wesley: "Isn't reading amazing. I mean it's like watching a movie in my head!" She's reading a book series right now called "Sophie the Awesome". What I want to know is where is the "Molly the Awesome" series?